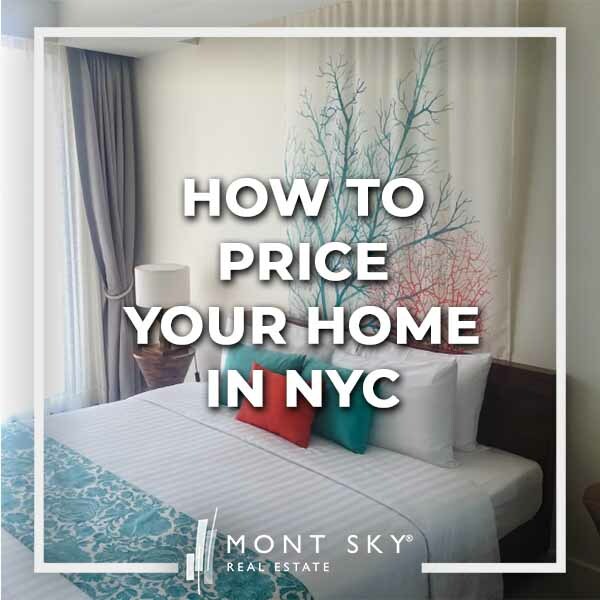 Whether you are an agent creating a comparative market analysis for a new seller client or a home owner looking to value your home, it’s important to learn how to price your home in the unique NYC market first. A comparative market analysis, commonly known as a “CMA,” is a way to benchmark your home against current listings on the market as well as listings that are already in contract as well as recently sold homes in your building and neighborhood. If the home you are pricing happens to be in a large building with many units, you’ll have an easy time with the analysis as there will bound to be many active, in-contract and recently sold units for you to compare against. You may even be fortunate enough to have units on higher or lower floors of the exact same line and layout as the property you are pricing. In situations like this, the comparable units (“comps”) in the building will be the most relevant for your analysis. If you happen to have a recent closed sale of the same line close to floor of your unit (i.e. 8E vs 9E with the same floorplan), you’re in luck as this will be the best indicator of market value for your home. You can then directly compare the units and make adjustments based on unit condition, recent renovations and view (i.e. if the 9th floor view just clears the neighboring buildings but the 8th floor does not). Therefore, if you have solid building comps to compare your home with, you are typically safe with just doing a spot check of average neighborhood prices to make sure you’re not too out of line. For example, if you have a $1.2mm condo in a large building with many comps, you can simply generate a comparables report via an online real estate search website like StreetEasy for condos under $2 million in your neighborhood. $2 million is a solid upper price range for your analysis as condo’s that are significantly higher in price can be splashy new developments with “hotel like living” that will skew the averages higher in price per square foot (“PPSF”). Ready to break into sales and work on some live leads? Comparing price per square foot across properties is the most commonly accepted way of determining market value. You will have an easier time doing a CMA for a condo because the square footage of condos are readily accessible. They are usually directly listed online on popular real estate search websites who pull them from public records such as ACRIS. You can typically also find square footage figures in the original offering plan or in the property’s property tax bill which is publicly available in the NYC Department of Finance website. It is harder to find an accurate square footage figure for co-op apartments, primarily because it is typically not written anywhere or easily accessible. Please remember that co-op apartments are not considered real property and that the cooperative corporation owns the entire building, and issues proprietary leases to the shareholders (i.e. apartment owners). Therefore, if you search on the NYC Department of Finance website for the co-op’s property tax bill, you will only be able to find the tax bill for the entire building. There is no guarantee that a square footage for each individual apartment will be listed in the building’s original offering plan either, which is typically very old for co-op buildings. Fortunately, some co-op listings will still advertise a specific square footage even though listing agents are traditionally loathe to do so for liability reasons. Furthermore, if you look carefully at the floor plans of some co-op listings, you’ll notice that the draftsman will have included a square footage number as well. While this can be helpful in estimating square footage, the best way to spot check a co-op size estimate is to see the space yourself. If you’re working with a potential home seller, he or she will have a good estimate of how big the space truly is. As you can see, PPSF may not be the best way to do a CMA for a co-op apartment. You may simply have to compare floorplans of similar apartments in the building. Ideally, you’d have units with the same line and footprint to be able to compare against. However, you may have to simply rely on sale comps of units that have similar floor plans (i.e. other 1 bed 1 bath sales in the building). Get a complimentary market evaluation of your home today! What if I live in a boutique building with few comps? You’ll have to do more work if you live in a small building with few recent sales or listings. If this is the case, you should search online for ideally 5 or more similar listings in your neighborhood that are for sale or have recently sold. It’s preferable to find comparable properties in your neighborhood if possible. However, keep in mind that there are great distinctions between different areas of the same neighborhood. For example, a property in central SoHo on Prince and West Broadway has a completely different neighborhood feel vs a property anywhere on tourist packed Broadway. Remember that co-op apartments are not considered real property and typically have stricter lifestyle rules and restrictions against subletting or pets. They will typically trade at a discount vs comparably sized condos or other real property such as townhouses. Multi-families are particularly popular with investors these days, and properties with a greater number of legal units (i.e. 4 family vs 3 family) will be valued more as the investor will typically be able to procure a greater total rent if he is able to split the property into more legal units. The layout of the apartment will affect the value of the square footage it has. If an apartment has an awkward and wasteful layout (i.e. long hallways) you can expect it to trade at a discount vs a comparably sized property. Similarly, if it has an optimal layout which maximizes the available space (i.e. split bedrooms with a square or rectangular shape) then it could trade at a premium vs the average comparably sized property. Have you recently gut renovated your apartment? Or has it been deteriorating without any upgrades for 15 years? The current condition of the unit can materially affect how much a property can rent and sell for. Buyers will factor in how much they will have to pay for renovations upon closing, and investors will estimate how much less they will collect on rent from an unrenovated apartment. Is your building very old and in need of major repairs in the near future? If a buyer suspects that major assessments will be levied in the near future, he or she will factor these potential future costs into his or her offer for your apartment. Furthermore, if your building has a high percentage of sponsor owned units, a low percentage of owner occupied units or simply a high concentration of ownership with one investor, future buyers may have difficulty securing financing from banks and this could negatively affect the value of your property. Buyers will also pay attention to the finances of your building and whether maintenance or common charges have increased substantially in recent years. Frequent maintenance increases above the pace of inflation could signal wasteful or inefficient building management. If a building is in poor financial condition and consistently runs a deficit without a reserve fund, this could signal an upcoming assessment or maintenance increases to a buyer. Once you’ve gathered your set of comparable properties, you should average the price per square foot of the set. This is the base PPSF to evaluate your home against. You can either use this number directly to value your home, or you can make slight adjustments to the average comp set PPSF for differences in features. You can make further adjustments with recent market trends or economic developments. For example, you may notice that rates are increasing which decreases the ability of many buyers to secure affordable mortgages. Or you may notice that supply is increasing and price cuts are becoming more common. Perhaps you’ve noticed that markets above a certain price range are staying on the market longer before entering contract. These are all factors which may warrant a price adjustment downward. Hi Rachel – here are some comps in advance of our meeting with your husband. The listing agent for 10E confirmed the actual contract price was $1.62mm and that it just closed. 10E has nice hardwood floors and updated bathrooms, though the kitchen seems just okay. 12D’s actual contract price is yet to be confirmed, but this one is a very nicely renovated sponsor sale. 10N is our direct competition, it’s 3bed/3bath and it’s a nicely renovated sponsor sale (though not as nice as 12D). I recommend that we list in the low 1400’s PPSF to be competitive. We will have to make a strong case against the 10E closing that your renovations are much much nicer!